With the sanctions on Iran tightening in recent months, its leadership has been trying to project business as usual. Iran is waging an extensive propaganda campaign at home, emphasizing that the sanctions have not harmed Iran’s oil exports and indeed are strengthening its local production in many areas. Yet the sanctions constitute the greatest economic, political, and governmental challenge Supreme Leader Khamenei has faced since the end of the Iran-Iraq War. Ahmadinejad’s government did not prepare in time for the intensity and scope of the sanctions. They probably assessed that, in light of the ongoing crisis of the Western economies, the likelihood of biting sanctions on the oil and banking sectors was low. In response to the intensifying sanctions and the ongoing foreign-currency crisis, domestic criticism of Ahmadinejad’s government’s poor performance has mounted. Critics in the Majlis (parliament), the media, and the religious establishment claim the Western-imposed sanctions have had only a minor effect on the economy and the problem mainly lies in the flawed performance of those entrusted to run the Iranian economy. Iran is now beginning to pay dearly for its heavy dependence on oil revenues. Although this dependence was no secret to the Iranian leadership, they wrongly assessed the seriousness of the West. Thus, Iran’s leadership now faces a higher potential than in the past of renewed public unrest backed by the religious establishment. Indeed, most of Iran’s senior clerics have withdrawn their support for Ahmadinejad and his supporters ahead of the upcoming presidential elections in June 2013. The Iranian regime has been encouraged by its successes so far in advancing its nuclear program (including the reported completion of the installation of centrifuges at the Fordo uranium enrichment site) and by the changes that are reshaping the Middle East. There is great doubt whether the challenges Iran faces will lead the current leadership to revise its nuclear policy and its preparedness for compromise with the West on the nuclear issue. 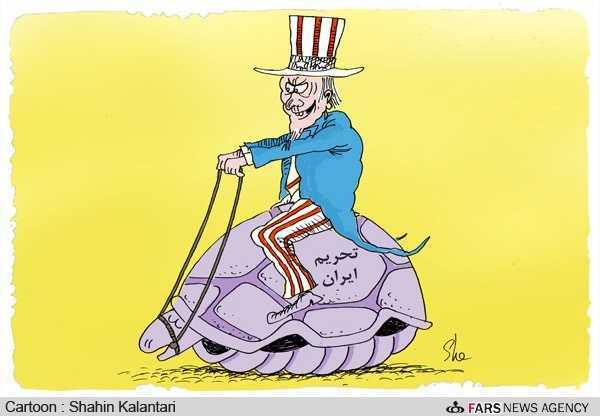 Since the effects of the sanctions are evident, in the West there are those who will exploit this fact to defer military action against Iran in order to give the sanctions “just another chance” to work. Iran will continue to promote the different components of its nuclear program and is prepared to pay the price of sanctions, believing it will be able to contain any popular protests as it has done in the past and to rely on the West’s eagerness to avoid any military action. With the sanctions on Iran tightening in recent months, its leadership including Supreme Leader Ali Khamenei, President Mahmoud Ahmadinejad, and the heads of the Iranian Revolutionary Guard Corps (IRGC) have been trying to project a business-as-usual atmosphere and underscore that the Iranian people are capable of coping with the “ineffective sanctions” as they have been doing successfully for more than thirty years of the revolution, during which they have stood firm against “the hostility of the United States and the West.” They reiterate that Iran’s nuclear program is only an excuse for imposing the sanctions, whereas the real reason is the West’s desire to contain Iran’s growing influence on the rapidly changing regional reality, especially in light of the Islamic Awakening (as Iran calls the Arab Spring), and to try and sway the results of Iran’s June 2013 elections. In actuality, the harsher the sanctions – particularly their dramatic effect on Iran’s revenues from crude-oil exports, which are a crucial part of the revenues on which Iran’s national budget depends – the greater their impact on Iran’s economy and society. The sanctions’ impact is gradually becoming a fundamental element of the domestic political-religious discourse conducted among the different political camps, the religious establishment, and the leadership, and between them and the Iranian people. The West’s sanctions and other measures (such as stopping the broadcasts of major Iranian satellite channels by a European satellite provider) are aimed at pressuring Tehran to give up the problematic and military components of its nuclear program and act with full transparency toward the International Atomic Energy Agency. Lately the Iranian nation has been facing a gang of enemies headed by the Satanic Zionist circles….Most unfortunately, the United States and several countries in the West are influenced by these circles….They have been opposing the Islamic Republic of Iran since its inception….At present they are intensifying the sanctions against us. These sanctions are not a matter of yesterday or today; they have accompanied the Iranian Revolution since its birth. Time after time they tighten the sanctions that are not working while pretending they will be lifted if Iran just renounces its nuclear capabilities; they are lying, the main reason for the sanctions is their blind hatred and their evil designs against the Iranian people….The sanctions are actually a declaration of war against an entire nation…. The sanctions levied on Iran over the past year – whose end is not yet in sight – constitute the greatest economic, political, and governmental challenge Khamenei has faced since the end of the Iran-Iraq War. The executive branch of the Iranian leadership, namely, Ahmadinejad’s government, did not prepare in time for the intensity and scope of the sanctions. They probably assessed that, in light of the ongoing crisis of the Western economies, the U.S. elections, and what they regard as the weakening of America’s status in the region and the strengthening of the Islamist movements, the likelihood of harsh sanctions on the oil sector was low. Hence, only in recent months has Iran begun to devise practical solutions (such as setting up private companies through which to export the oil) in an attempt to revive, if only partly, the inflow of revenue via alternative oil export channels that are not susceptible to sanctions, and to adjust the deteriorating Iranian economy to the changing reality. Meanwhile, as part of the efforts to curtail the sanctions’ impact on public opinion, Iran is waging an extensive propaganda campaign at home, emphasizing that the sanctions have not harmed Iran’s oil exports and indeed are strengthening its local production in many areas. Oil Minister Rostam Qasemi recently rejected claims of a decline in Iran’s oil production and said Iran was continuing to produce four million barrels of crude oil per day. He threatened that if the West increased the pressures and sanctions, Iran would stop exporting crude oil, a step that will lead to global price hikes. He said, without going into detail, that Iran has an alternative plan that will enable it to run the country without any need for crude-oil exports.6 For its part, the Iranian media from time to time reports a rise in Iranian exports of non-oil products. Indeed, at its inception (March 2012) Khamenei declared the Persian year as one of local production, and many spokesmen invoke this statement to explain the dramatic reduction in imports of basic products that are deemed “superfluous” for Iran. In response to the intensifying sanctions and the ongoing foreign-currency crisis, criticism of Ahmadinejad’s government has mounted. Whereas government officials seek to blame the distress on the sanctions and foreign actors, government critics in the Majlis, the media, and cyberspace claim the sanctions have had only a minor effect on the economy and the problem mainly lies in the flawed performance of the government and those entrusted to run the Iranian economy. In an editorial, the popular Iranian website Alef analyzed the “real” reasons for the sanctions, asserting it is not Iran’s uranium enrichment or hostility to Israel, nor the West’s lack of trust in Iran, that is responsible. The real reason, the author claims, is Iran’s fundamental nature and guiding tenets, and the challenge it poses to the West as an ideological and cultural alternative. Hence, the author argues, the truth about the sanctions should not be concealed from the public; this candor will enable it to prepare adequately for the damage they wreak. Why is the Iranian media not publicizing the fact that Iran is now selling less than a million barrels of oil and even that with great difficulty? If citizens come to know this truth and similar truths, will they not complain less and be understanding and cooperative? Should one not explain to the public that the current sanctions are by far the most severe since the Iran-Iraq War, yet we must stand firm for the sake of the country’s future? Even if we hide the truth from the public, it will in any case discover it in Western media; is it not preferable that the public should hear the explanations straight from the leadership and in a logical fashion? We must say (candidly) that the sanctions are indeed taking a considerable toll; the approach adopted by some of the media and the senior officials, claiming the sanctions are having no impact, is meant to boost the public’s morale, but is it not preferable to admit that the sanctions are having and will have effects and consequences, but we must suffer these consequences for reasons of one kind or another? Even if the public is told that the sanctions are having no effect, are they not able to realize this themselves in light of the dramatic rise in the prices of products? The article’s author also warns against some elements’ exploiting the sanctions to slam the government and advance their interests in the run-up to the elections. In recent weeks an affair has rocked Iran and revealed the intensity of the dispute between its different camps as well as the nadir to which Ahmadinejad’s status has sunk domestically. It concerns the president’s requests to visit Ali Akbar Javanfekr, his senior media adviser who is now imprisoned in Tehran’s Evin Prison, and the rebuff of his requests by the judiciary on two occasions. The affair shows again how Ahmadinejad and his “deviant” camp are trying to move the goalposts in challenging Khamenei and his authority. Lately there have been such exchanges of letters of a communicative and public nature, something that arouses tensions. Under the current circumstances, a legal prohibition has been applied to creating tension. The country has problems that we must grapple with. The responsible officials must put aside the peripheral and unimportant issues and address the problems of the public such as the high cost of living, inflation, the sanctions, economic distress, and moral problems. Do not deal with issues that are not essential to the country; look at the foreign media and see what a sensation they are making out of these matters, claiming that the leaders of the country are fighting with each other. Along with the criticism of President Ahmadinejad and his government’s poor performance and inability to deal effectively with the economic crisis, there are signs of life among the reformist elements. These elements stress what they say is a link between, on the one hand, the ongoing foreign-currency market crisis in particular and Iran’s problems in general, and on the other, Iran’s ongoing massive assistance to the regime of Bashar Assad (similar claims having been made in the past about Iran’s aid to the Palestinians). The reformists claim that the “Green discourse” continues under the surface and has taken hold in certain sectors. In any case, the developments in Syria are likely to have far-reaching implications for the domestic Iranian arena. The fall of Bashar Assad – who is perceived in Iran as one of the symbols of steadfastness against the West and Israel – is likely to be perceived by the opposition as weakness and they are likely to exploit it by intensifying their protests. Iran is now beginning to pay dearly for its dependence on oil revenues. Although this dependence was no secret to the heads of the regime, they wrongly assessed the seriousness of the West, which, while it indeed wants to avoid military action against Iran, seeks instead to impose biting sanctions at a time of global economic travails. Iran’s leadership, which wants to downplay as much as possible the economic crisis caused by the sanctions, especially with the ongoing loss of oil revenues, now faces a higher potential than in the past of renewed public protest backed by the religious establishment. That is why the leadership broke up the bazaar demonstrations sparked by the foreign-currency crisis. Nevertheless, the regime’s ongoing involvement and strong support for Syria, in the face of the escalating economic crisis, continues to fan public criticism of the regime among different sectors. So far, however, the sanctions’ impact on the public has not caused a substantial change in the nature of the anti-regime protest; it is still confined to cyberspace with only a few manifestations in physical reality. At the same time, most of Iran’s senior religious officials have withdrawn their support for Ahmadinejad. They attack him for pursuing a personal agenda that ignores the public and blame his government, not the sanctions, for the socioeconomic crisis. Should the social protest gather steam, figures from the religious establishment, some of whom already support the Green Movement and reformist elements, will likely join the protest and give it religious-legal validation. Any change in Iran will indeed require validation by the religious establishment, as was the case with other revolutions in Iranian history. In any event, the June 2013 elections have already begun to play a central role in Iran’s domestic discourse and are already directly associated – at home and abroad – with the issue of the sanctions and the economic crisis. Iran’s leadership claims – as it did in the previous elections – that the West is trying to use the sanctions to determine the results of the election and bring about a change in the Iranian regime. The closer the date of the elections, the more the regime is likely to beef up security measures. It is already warning elements in the domestic security forces against any attempt to disrupt the elections and the preparations for them. Despite the growing challenges in the domestic arena and in the economic sphere and the difficulties the regime is encountering regarding its efforts to unite the Iranian people around the price it is required to pay for Iran’s nuclear independence, the ideological components and the goal that Iran has set for itself to lead the Islamic world have remained strong and firm, as well as its resolve to continue to develop its nuclear program. Recently, it was even reported that Iran is completing the array of centrifuges at the Fordow site near Qom. The Iranian regime has been encouraged by its successes so far in advancing its nuclear program and by the changes that are reshaping the Middle East. For the moment, it is not deterred by the price it has to pay in the domestic arena for continuing its defiance of the West on the nuclear issue and with its continuing support for Syria. In general, there is great doubt whether the challenges Iran faces – and at their head the intensifying sanctions that levy a heavy price from Iran – will lead the regime to change its nuclear policy and its preparedness for compromise with the West on this issue. In sum, as the Iranian leadership admits, the sanctions are affecting Iran’s economy and presenting challenges of a kind unknown in the past. At the moment the leadership is following a policy of concealment from the public. Yet since the effects of the sanctions are evident, in the West there are those who will exploit this fact to defer military action against Iran in order to give the sanctions another chance to work. Iran will continue to promote the different components of its nuclear program and is prepared to pay the price of sanctions, believing it will be able to contain any popular protests as it has done in the past and to rely on the West’s eagerness to avoid any military action.